Join the discussion on our forums! 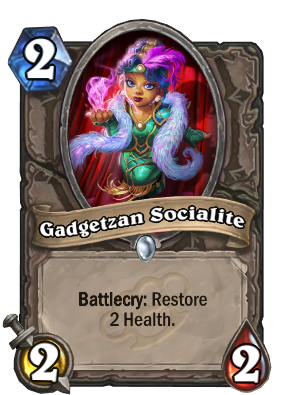 Come discuss Gadgetzan Socialite over in our dedicated Gadgetzan Socialite discussion topic. Comment on her height, and she'll go from flapper to kneecapper in seconds flat. A P P L E S A U C E ! This could probably use one more attack or defense. The golden version of this card looks awesome! oh this is actually Rihanna! Brode: Now to Rogue players out there, ARE YOU SATISFIED YET? Filler card, not that good. It's cuter than Voodoo Doctor … well … that's it. It's a decent two drop and a decent pick for priest. Is that Rihanna's gnome sister? yes it is rihanna forshow! So it's just a small version of Earthen Ring Farseer. The creativity is outstanding. Seems like it would either complement ERF or could substitute for it in a lower curved Renolock deck. Not bad to have another early drop for Renolock. She prefers the term Social-lite to Fancy Dwarf.